Have you seen the lovely monochrome papers in the new occasions catalogue? I think they are delicious. Flowers and or leaves in different combinations some in white with a black background others in black with a white background. 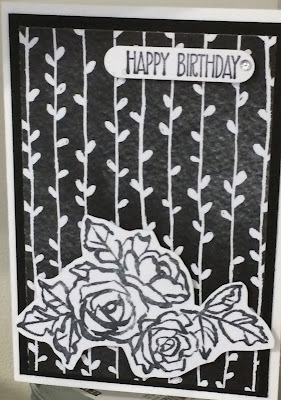 The patterns are delicate so I have used them with a little stamping on the Stampin'Up note cards which are smaller than a standard C6 card. 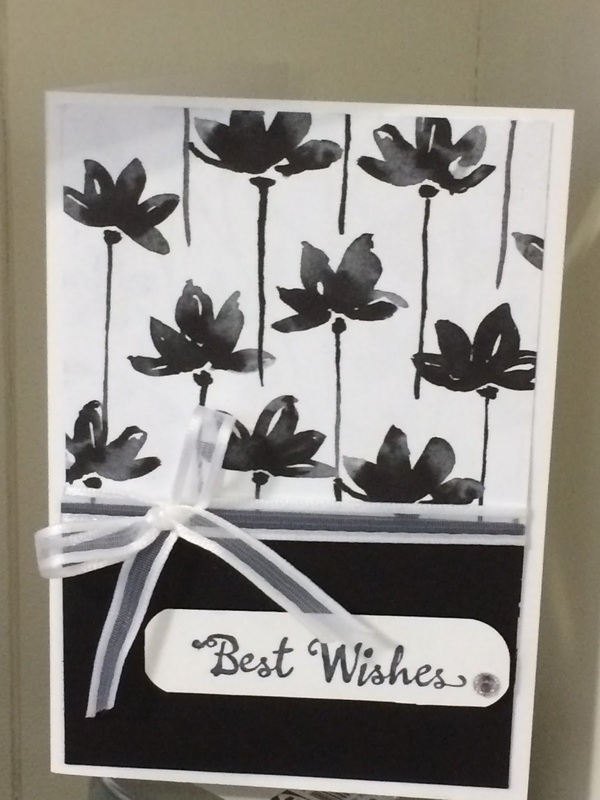 Combining black and white card with the designer paper I have created 5 little cards. I have kept the stamping simple so that a beginner could be successful making this little set. 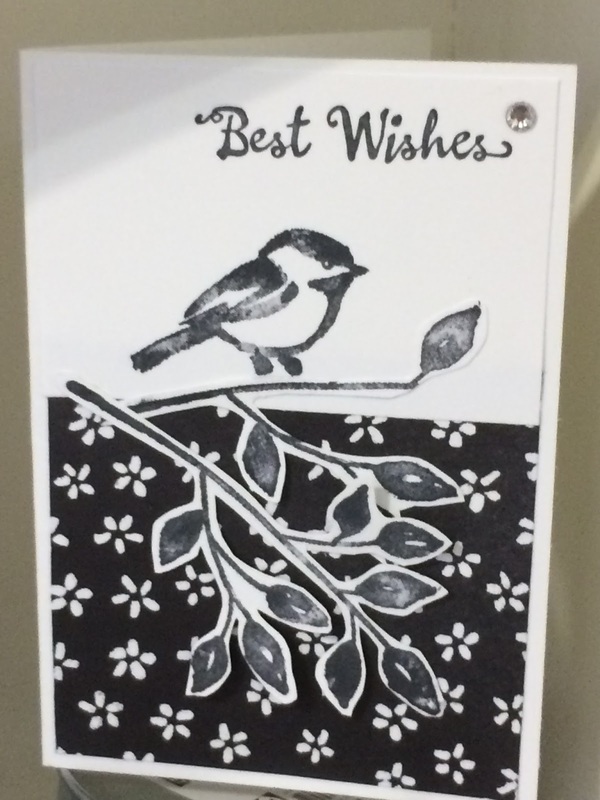 This would be the first card with just the sentiment stamped. The organza ribbon is just the right width for these size of cards. For these three cards its simple stamping again with some fussy cutting. And finally all over stamping, with a little more fussy cutting. I hope you have enjoyed looking at this project. I have a class making this on February 10th, join me. Today I have a second frame for you. Yes the same stamp set as yesterday but with a completely different mood. I loved getting the paintbrushes out to complete this one. Even though much of it is water-coloured its still on standard whisper white card. 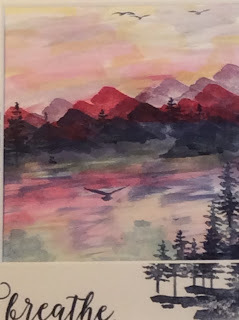 I started with the night of navy ink for the nearest set of hills, a bit of watercolouring extending the ink into the water, I have put a layer of dark green - Always artichoke, below the hills and just pulled the blue paint over that. Then for the hills behind... I have use the rose red, the cherry cobbler felt a bit dark and the real red was too bright. I tend to have a bit of scarp card next to me to try out the colour combinations. (or the grid paper!) The final layer of hills are stamped in perfect plum. The sea and the sky have just used the colours I have stamped with. The trees are stamped with night of navy as is the land they are are standing on. I did find the quality of the frame card to stamp on was difficult, they do vary. The birds are also stamped in night of navy, The birds in the sky were stamped off first to give them a pale far away look the bird over the water was coloured with the marker pen and ... I just went for it! Well there are stamps and there are stamp sets. I seem to go for the ones that can be watercoloured and grunged and are not really the clean and simple type. I do make clean and simple as there are a lot of people who love that but my love is really the opposite. 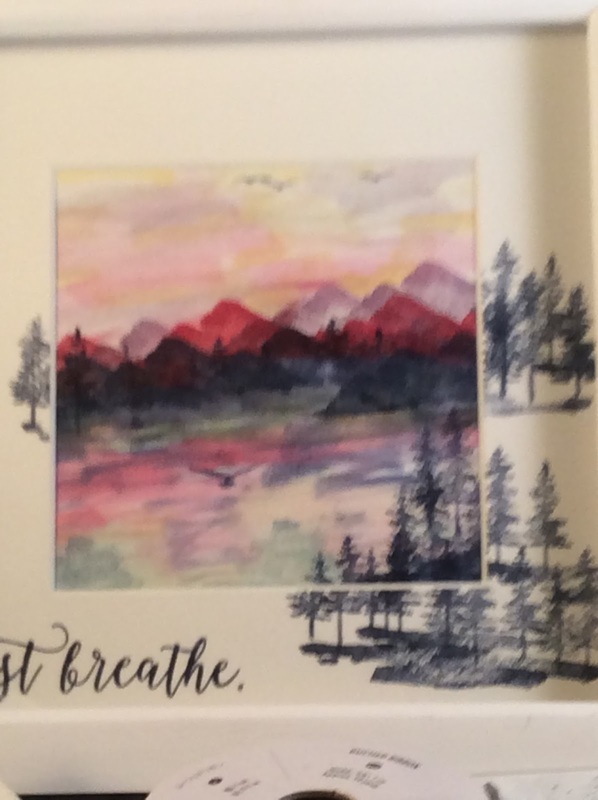 I think the last annual catalogue from Stampin'Up is the best ever and I have been a demonstrator for 5 years but I was a little upset that the 'wetlands'set had not carried forward. The only set that I could see that came remotely close was the one with the lighthouse and that wasn't quite there. So in the spring occasions catalogue I was relieved to find the 'Waterfront ' set. Its near the back of the catalogue but my copy got a big tick by that set I knew it would be my first purchase. So with a clear desk I set out to play. Choosing your colours is the first step and to be honest I don't think you can go wrong. Different combinations bring different seasons/feelings/moods and you then add elements to suit. This was my first make. I have used standard Stampin'Up whisper white card. I wanted to use the little beach hut so the colours were picked to match. In my stash I had the shells. I just love it hope you do to. Doesn't it make you feel summery? Now that I have finished it. I have found a few more sentiments that I could use. The birds are from the set with the lighthouse. 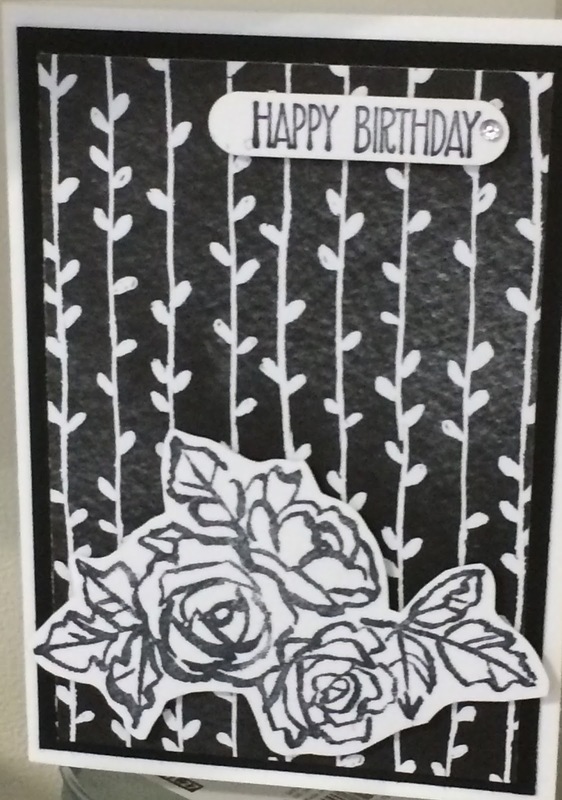 I love coming out of the frame with the stamping. More with this set over this week. 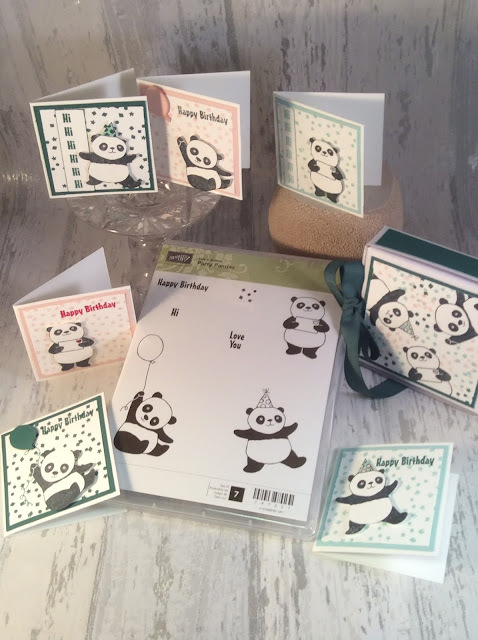 The panda's are one of the free stamp sets in the Sale-A-Bration brochure. They weren't my first choice but I have used them more than any of the other sets! To my great surprise! They are cute. 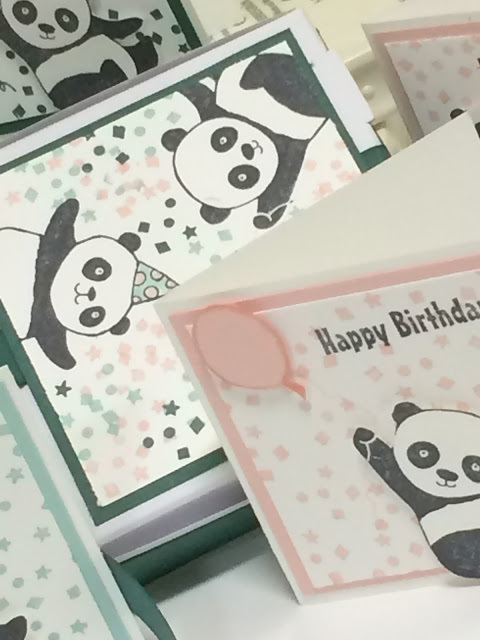 For these makes I have used the three colours from one of the co-ordinating colour packs of A4 card which have been put together to match designer paper. Buying these packs of A4 card gives you a good range of colours with out having to buy 3 complete packs. The mini pizza boxes take 3" square envelopes/cards. Using these is a bit different to a normal sized card. 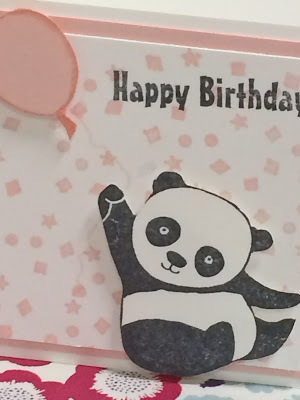 Designs have to be in proportion and the images small enough to not make the card look crowded. The panda stamps are ideal. 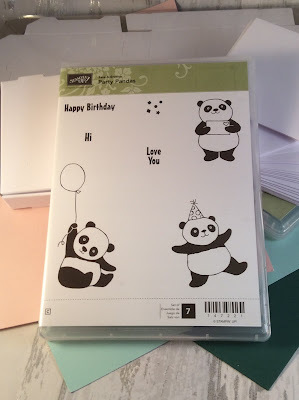 The panda's have been stamped and fussy cut. I have coloured the little heart on the envelope one is holding and the hats with marker pens. 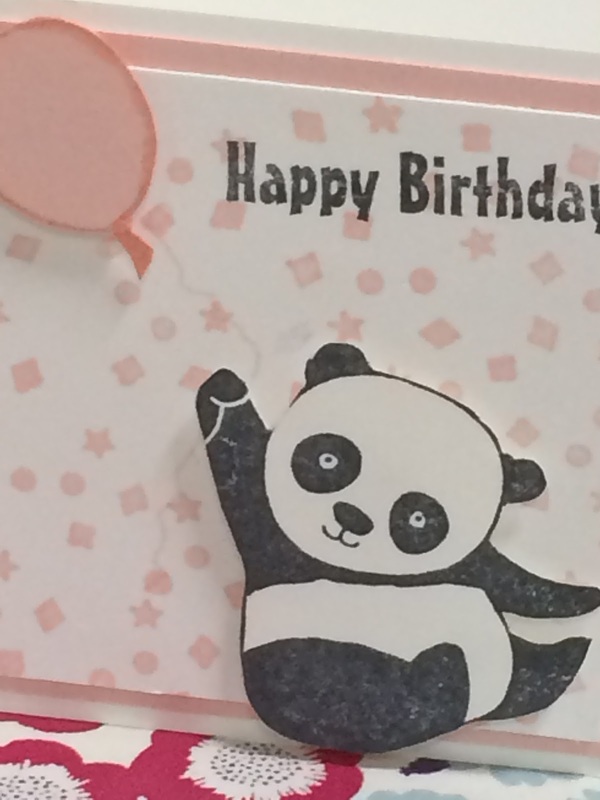 The box lid is decorated with the three colours and then one of each panda. 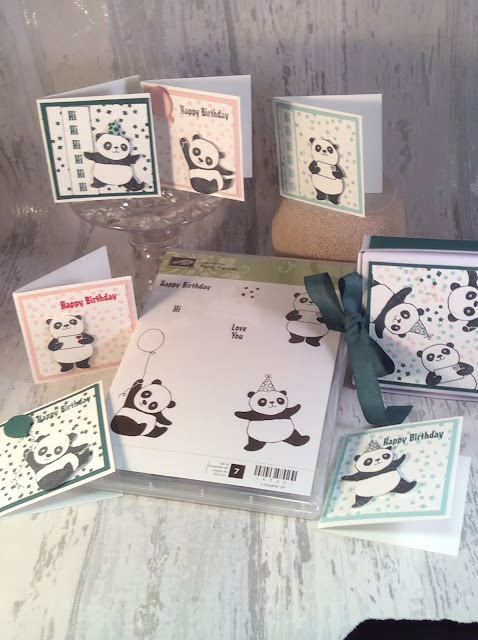 If you would like to find out more about the panda stamp set message me. 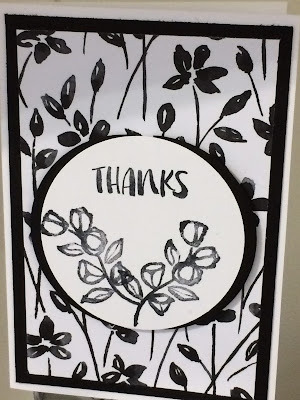 I use my Stampin'Up markers in lots of different ways. I colour stamps with them, I use them with my aqua painters, I colour in with them. As there are nearly 50 to choose from I am never short of a colour but they don't blend very well as they dry quickly and you don't have graduations of colour. In the new Occasions catalogue there is a full page spread for the new Stampin'Up Blends. I bought 3 of the colours with my last order. 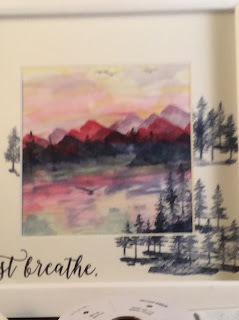 I wanted to have a go with the blending. I have been using Copic colouring for a few years. I do love it but it takes time and sometimes I have 4 or 5 graduations of colour to get what I want. 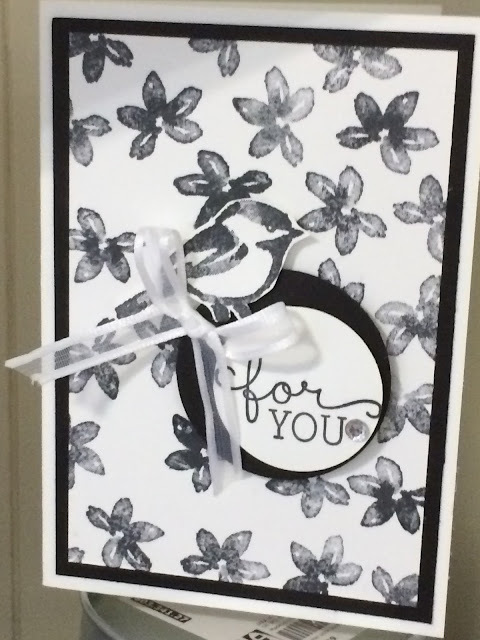 Well the Stampin' Up blends you have 2 so they are quick and easy. I have found that colouring a small area with the dark pen first then adding the lighter colour and spreading the darker colour gives me the best results. And the results do look good. Makes tomorrow! Its been a while and a lot has happened! Firstly Happy New Year to all my readers. I have just moved studio and am now in an organised chaotic state. 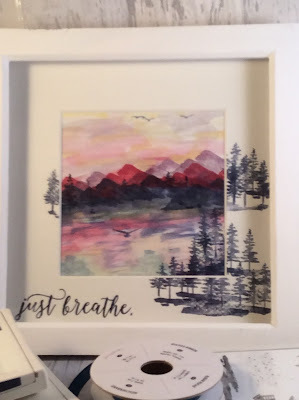 I am just getting back into crafting but its been quite a traumatic move. 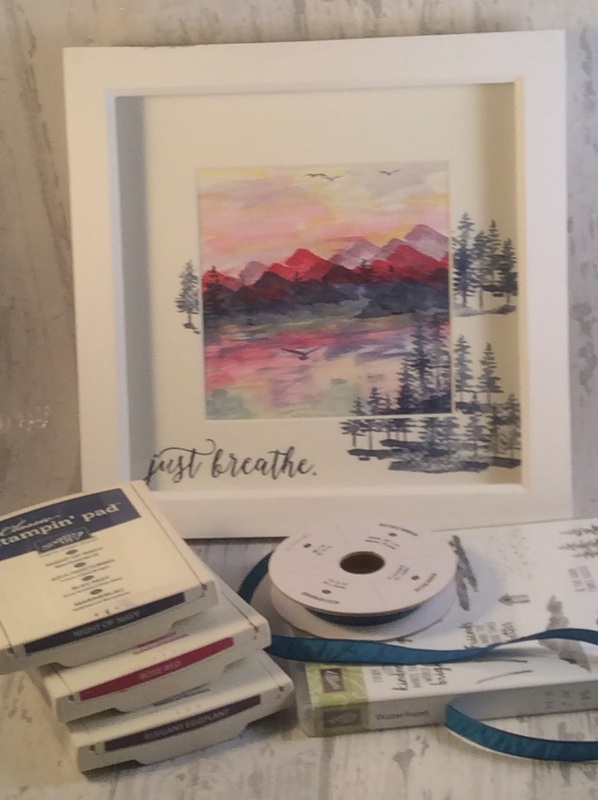 Classes started again this week with my regular ladies who appreciate that everything will find a home eventually and that in the next couple of weeks new displays will appear. 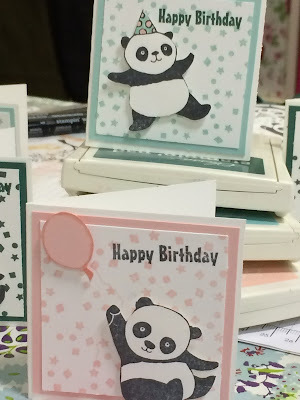 The class this week was with one of the Sale-A-Bration stamp sets. It wasn't my first choice but it is cute. I have had so many comments about this that the class is running a second time next week on Tuesday afternoon.